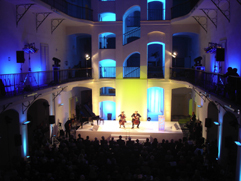 Czech Cellist František Brikcius will appear with unique programme "Tartini's L'Arte dell'Arco in the interpretation of František Brikcius" at Festival Theatrum Kuks on Thursday 27th August 2009 at 7.30pm at Kostel Nejsv. Trojice in Kuks. Festival opening speech of Ministry of Culture of the Czech Republic will be preceded the concert. L'Arte dell'Arco (The Art of Bowing) is 50 variations written by Italian baroque composer Giuseppe Tartini (1692-1770) on the theme of Corelli's Gavotte in the transcription of French cellist Paul Bazelaire (1886-1958) for cello solo. Project "Tartini's L'Arte dell'Arco in the interpretation of František Brikcius" together with "Prague - Brno: 6 Contemporary Composers for Cello Solo in the Interpretation of František Brikcius" project has been already presented as part of the "Brikcius Cello Tour 2007" in Austria, Czech Republic, France, Italy, Russia and United Kingdom. More information can be found on websites http://www.Brikcius.com , http://www.Theatrum.Zde.cz and http://www.Paul-Bazelaire.com . What French festival Czech Cellist František Brikcius performed "Tartini's Art of Bowing in the Interpretation of František Brikcius"? Contest is over, drawn winners are: M. V. from Prague a L. K. from Hořice. Legendary Cellist Anna Shuttleworth (born 1927) is from the United Kingdom. She studied cello with Ivor James and Harvey Phillips at the Royal College of Music and later became a professor at the same college. Her pupils have included Alexander Baillie, Natalie Clein and František Brikcius. Anna's cello journey started early and took her to study with famous cellists such as Enrico Mainardi and Pablo Casals. As a performer, as well as a highly regarded teacher, she is known to have a musical sixth sense, and she was friendly with many well-known musicians of her time, including Gerald Finzi, Ralph Vaughan Williams (who fondly called her 'The Swellest Cellist'), Colin Davis, Mstislav Rostropovič and Jacqueline du Pré. 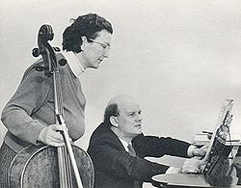 Through the connection with Hilary Finzi, Jacqueline du Pré's sister, Anna was allowed to play on Jacqui's Davidov Stradivarius for two years. She became a "sought after" cello professor at the RCM and taught many of today's well-know musicians, including Adrian Brendel, Alexander Baillie, Clare Finzi, Elizabeth Wilson and Jonathan del Mar. Since the 1960s Anna has performed many successful piano and cello recitals with some of the leading pianists in Britain, including Bernard Roberts, Ian Brown, Martin Roscoe and John Thwaites. Since leaving the RCM in the late 1940s Anna has been a member of numerous chamber music ensembles including a string trio with Elisabeth Watson (viola), Georgian String Quartet, Leonardo Trio (first with David Roth, later with Maureen Smith, violin and with Ian Brown, piano), London Harpsichord Ensemble, Glickman Trio and Aulos Ensemble. When in London she knew Sylvia Cleaver who in 1964 asked Anna to become the principal cellist of the Midland Sinfonia Orchestra (later renamed the English Sinfonia). She held this post until she retired from the orchestra in 1996. Anna's teaching career evolved over the years. 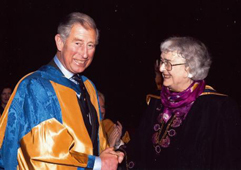 From initially teaching at independent schools and later being appointed a professor at the RCM she eventually took on many teaching positions in England, including Canterbury, Leeds and students from York University. In 2008 Anna was awarded an Honorary Membership of the Royal College of Music from Prince Charles. Anna Shuttleworth recently hosted two gatherings in London and Leeds to celebrate her 82nd birthday and the publication of her memoirs. You could hear a brief introduction to the book together with sort reading from selected chapters and some cello music (e.g. Czech Cellist František Brikcius - Irena Kosíková: Fantasie II - Saro Wiwa for Cello Solo & Petr Hejný: Metal Sonata for Cello Solo). Anna Shuttleworth's memoirs, edited by Tomas Sterner, is now available for purchase via the Trafford Publishing website. In her book she describes her musical and personal life, with many insights into cello technique and performance. For more information of the life of Anna and her memoirs go to http://www.AnnaShuttleworth.com and http://En.Wikipedia.org/Wiki/Anna_Shuttleworth. Are you looking for concert dramaturgy for the European Days of Jewish Culture in September?